« Who Is David McCormick? 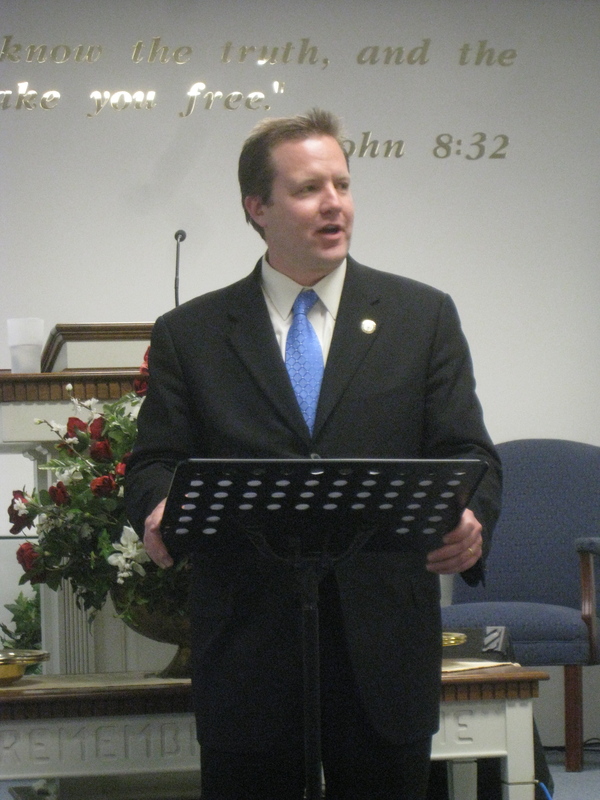 Earlier tonight, Corey Stewart, Chairman of the Prince William County Board of Supervisors, was the guest speaker at the meeting of the Harrisonburg branch of the Shenandoah Valley Tea Party. There were about sixty folks in attendance and the reaction to Stewart’s actions against illegal immigration seemed to be very positive. Given their response, I would expect that most, if not of all, of my fellow tea partiers agree that substantial steps need to be taken, like was done in Prince William County, to combat this problem. One humorous moment in the night came when Mr. Stewart asked the audience where they thought the illegal immigrants who left Prince William County went. A handful of people shouted out “Harrisonburg!” Even though it is clear that Prince William County suffered from many more negative aspects of this illegal influx, it is also true that Harrisonburg and Rockingham County are seeing increasing problems as a result of the federal government failing to protect our borders and enforce the laws already in place. When it came to the question and answer segment of the night, I asked Mr. Stewart why he thought some of my fellow conservative activists and bloggers would oppose his efforts against illegal immigration. His reply was that they may be concerned about the possibility of a Hispanic backlash against conservatives, due to the potential for racial profiling and for failing to welcome others of their race with open arms. In reply, he noted that there has not been one verified case of racial profiling in Prince William since his policy was enacted. In addition, he added that many of the legal immigrants with whom he has spoken oppose illegal immigration too. After all, if they took the time and effort to follow the necessary steps to be here legally, why should those who shortcut the system (i.e. those who break the law) be similarly rewarded? Although immigration proved to be the hot button issue of the night, one also has to wonder about the possibility of Mr. Stewart seeking the Republican nomination for Virginia’s soon-to-be vacated Senate seat. Given his rhetoric both this evening and in previous comments, I would guess that his run is highly likely. After all, why would he draw so many areas of difference between himself and George Allen otherwise? With that assumption in mind, even though his position on illegals is quite clear, I would be interested to learn how Mr. Stewart stands on a whole multitude of fiscal, social, and constitutional issues. After all, as we learned from Tom Tancredo back in 2007-08, one cannot win a large-scale election on the back of fighting illegal immigration alone. I want to thank Corey Stewart for coming out to our meeting tonight and I wish him well in his upcoming battle to retain his Chairmanship of Prince William County. One does have to wonder if his Rule of Law Campaign will spread to other localities and become a statewide program. Regardless of how 2011 and 2012 ultimately turn out, I expect Virginians will hear more from Mr. Stewart in the coming years. I liked what Corey Stewart had to say about illegal immigration. That is another reason why we need to take over the Virginia State Senate and get a majority. We definitely need to do more to get rid of illegal immigrants who commit crimes. I also would like to know where Corey stands on the issues. I really don’t think that there is much difference between him and George Allen. George has a good voting record. On some issues I don’t think that George Allen wants to be out in front because he wants votes from moderates etc. He does not want to alienate them.